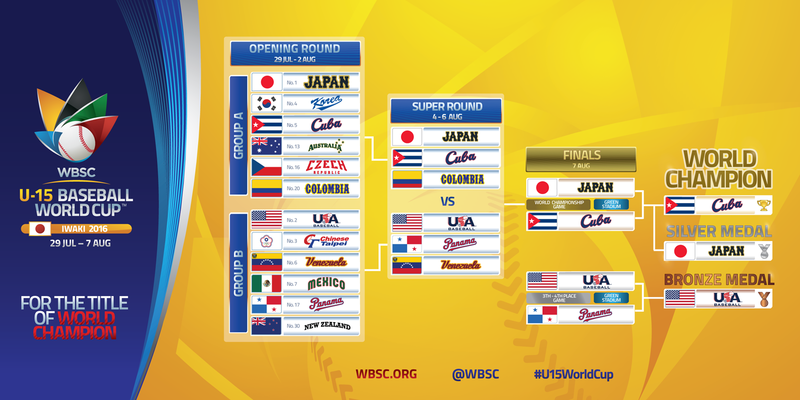 Cuba successfully defended their World Baseball Softball Confederation (WBSC) Under-15 Baseball World Cup title, after beating hosts Japan in the final in Iwaki. The Japanese team were hoping to avenge their defeat from the 2014 final, but found themselves 5-0 down after just two innings of the contest. Cuba all but put the match out of the host nation’s reach in the fourth innings, as they scored another three runs to stretch their advantage to 8-0. The victory continues Cuba’s excellent record in the tournament’s history, having now triumphed on six occasions. The United States are the second most successful team, with five wins, two silver and two bronze medals. Their latest bronze came as a result of a comfortable victory over Panama today, despite a tight start to the match. Both teams secured a point early on and the score remained locked at 1-1 until the seventh innings. The United States, though, were able to achieve six runs during the innings to move into a commanding lead and they extended it to 8-1 in the eighth. Eventually Panama hit back, but they could not prevent an 8-3 defeat.